One of a number of underwater themed slot games, Fish Party from Microgaming is a five reel, 243 ways to win slot which introduces players to a whole host of adorable sea critters. Those fish, crustaceans and other marine creatures account for the symbols on the slots reels and also play their part in the game’s handful of additional features. Those features include free spins triggered by a scatter, stacked wilds and a Gamble Feature which gives players the chance to either double or quadruple any jackpot. Fish Party has a really fun theme, which includes reel symbols with enjoyable fishy characters, good overall graphics and a funky soundtrack. The slot’s scatter can trigger fully 20 free spins, which can deliver really nice winnings thanks to the Super Stacked Wilds which are introduced to free spin gameplay. 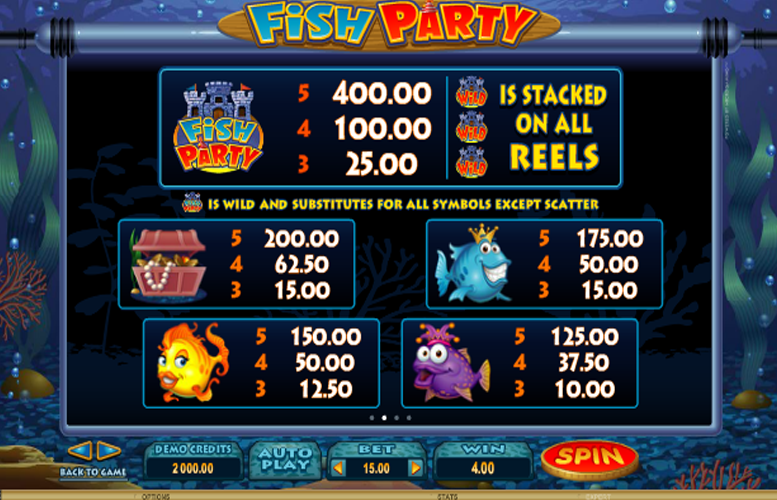 The fact that the game’s wild is stacked on all reels during the main Fish Party game, means that it often helps players to achieve more valuable winning combinations. Standard jackpots available during the base Fish Party game are a little on the low side, with the top payout being worth only 13.33 times a player’s total bet. 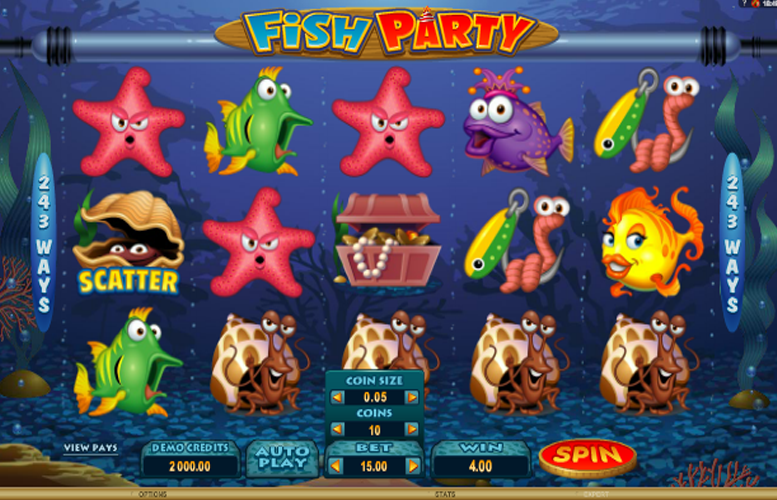 Free spins and wild symbols help to boost the slot’s winning potential, but Fish Party does not include a bonus round or side game to add extra interest to gameplay. However during the free spins round there is a max win of 97,000 coins available! Players who like their slots to be immersive and to have lots of additional gameplay features will be disappointed to find that Fish Party does not have a bonus round. It does, however, feature handy wild symbols and a potentially beneficial Gamble Feature. The slot’s wilds substitute for all symbols except the Clam Scatter and appear stacked on all reels during the main game. The Gamble Feature, meanwhile, gives players the chance to either double or quadruple any payout they receive. Payouts are doubled if a player successfully guesses the colour of a face down playing card and are quadrupled if they successfully guess its suit. 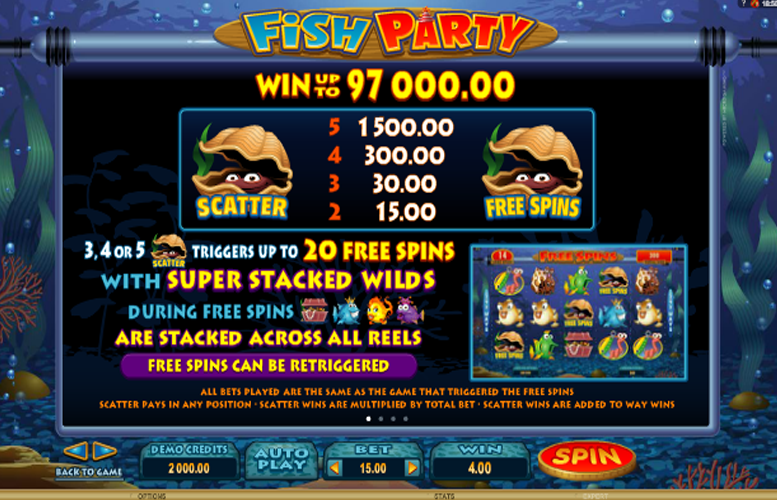 20 Fish Party free spins are triggered as and when three, four or five of the game’s Clam Scatter symbols appear on the reels at one time. During those free spins, which can be retriggered by the appearance of further scatters, four of the slot’s symbols become so-called Super Stacked Wilds. They will substitute for other symbols to create more winning combinations and are stacked across all the reels. If and when Fish Party players want to change how much they’re going to bet per spin, they can do so in two different ways. They can alter the number of coins they bet and/or set how much each of those coins is worth. Anywhere between one and ten coins can be wagered per spin and a variety of coin values between 1p and 20p are available to choose from. 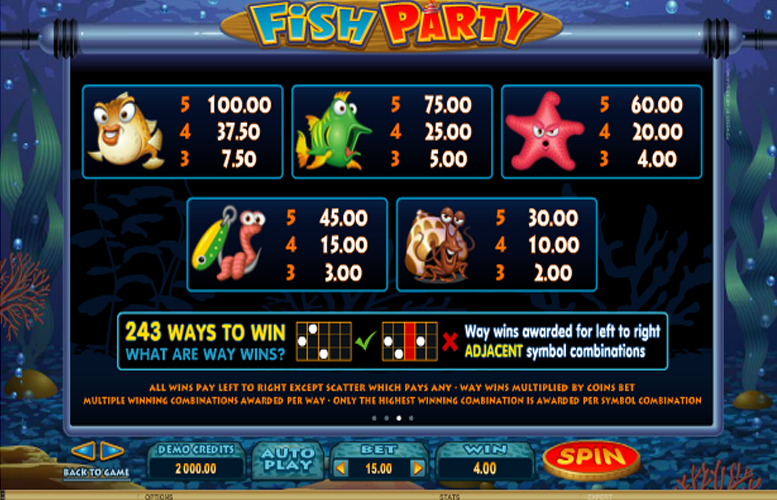 As Fish Party is a 243 ways to win slot, whatever choices a player makes then have a 30x bet multiplier applied to the. A minimum bet of 30p is possible, therefore, as is a maximum wager of £60. When it comes down to it, Fish Party is a perfectly decent is unspectacular slot game. The under the sea theme is carried off pretty well and many players are sure to like the cheery critters which inhabit the game’s reels. Wilds and free spins are also certain to be popular with players, and the Gamble Feature adds an extra way in which those players can boost their winnings. Those winnings, however, are likely to be a fair bit lower than players might be forgiven for expecting. Fish Party jackpots are a bit stingy across the board, and a top jackpot worth just 13.33 times the total bet is fairly uninspiring. The lack of any bonus round or second screen game, too, means that the slot’s gameplay is equally unspectacular. This game has a rating of 3 / 5 with 334 total reviews by the users.